Erin and I attended the opening performance of "Lady Day at Emerson's Bar & Grill," a moving tribute to the tragic life of jazz singer Billie Holiday, who is remembered today for classic renditions of "God Bless the Child" and the stark song condemning the racist lynching of black men she first recorded in 1939, "Strange Fruit." Holiday was one of the most influential singers ever, whose influence crossed over jazz and blues to folk, R&B, rock and pop music. 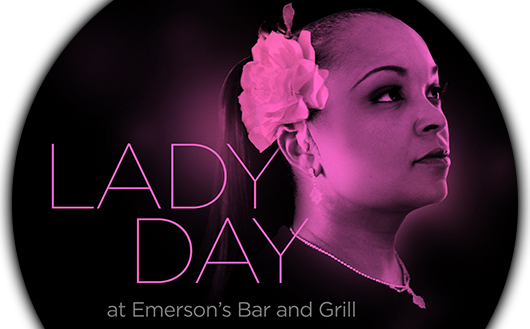 "Lady Day at Emerson's Bar & Grill" is set in a bar in Philadelphia just months before her death in July 1959 from heart failure caused by cirrhosis. We recently were privileged to enjoy a concert of contemporary jazz by a vibrant young group from Japan, the Ai Kuwabara Trio Project. Simply put, the combo rocked the joint at the King Center for the Performing Arts at the Auraria campus. The auditorium was full for the free performance, and I bet everyone there were blown away. Pianist Kuwabara is impossibly young for such an astonishingly assured and accomplished musician and composer. She's a mere 23 years old, but she and her bassist and musical partner Yusuke Morita have already released two albums as the Ai Kuwabara Trio Project (the "Project" part is because the group doesn't have a permanent drummer, though Shintaro Imamura is doing a sterling job on the current tour). The musicians' youth comes through in the way they are almost starstruck at their own success. At a pre-show reception, Kuwabara bowed deeply when she was introduced to Ikuhiko Ono, the Consul General of Japan at Denver, and his wife Eiko. The tour is organized by the Japan Foundation of Los Angeles, which brings a variety of Japanese arts and culture and showcases them here in the States. This particular tour was too brief: The group played in Berkeley and LA before coming to Denver, and the next day they flew off to Anchorage -- yes, Alaska -- to perform one more time before flying back to Japan. Charmaine Clamor’s Colorado concert was great — we’d love to see her again! We've taken several months off, but Erin and I are ready to resume our series of interviews with inspirational Asian Americans for 2010. We're especially proud to be able to speak with Dan Kuramoto, one of the founding members of the fusion jazz group Hiroshima, because the group has been nominated twice for a Grammy award! We'll be speaking with Dan on Tuesday, March 2 at 6 pm PT (9 pm ET). You can register now for the call and submit questions for Dan on our webcast page. Only a few Asian Americans have been nominated for a Grammy Award over the years, and Hiroshima has managed the feat twice -- once in 1980 for "Winds of Change," a track off the groups second album, "Odori." Hiroshima was nominated again for their latest album "Legacy," a collection of re-recordings of songs from the band's first ten years together. The band has been together for over 30 years, and have become an institution on the fusion jazz and R&B scene. It's a somewhat goulish idea: take a recording of a late, great artist, and shore it up with new backing tracks. It's been done before, with Natalie Cole's "duet" with her father, and the remaining Beatles backing a newly-discovered John Lennon solo track. And if you wanna look at it from a contemporary perspective, digital "mashups" that overlay, for instance, Nirvana with Destiny's Child accomplish the same idea with spooky success. On "Ray Sings, Basie Swings," the legendary vocalist is paired up via technology to the current and living version of the Count Basie Orchestra, and the result is a brassy, sassy and sometimes strange album from the grave. Jazz as a genre can span the range from big-band swing, melodic pop standards and mainstream funk-rock , to cool, bop, and way the hell out there. Branford Marsalis is one musician who not only understands, but also appreciates, the big ol' umbrella that the word represents. The oldest son in a jazz history-making family, the Brooklyn-born saxophonist has played the pure stuff as well as the pop stuff. He played with Miles, and led the "Tonight Show" band. He performed with his brother, Wynton, and toured with the Grateful Dead. Despite his dabbling with the "dark side" of pop music, though, no one questions his ability, nor his dedication to, the traditions of jazz.